Two weeks ago Jain @Once in a Blue Moon launched her Food For Thought meme and two of my favourite blogger friends Sarah @HFTS and Carol @ Serendipity took part. Click on the links to see which books they recommended. Food For Thought combines three of my favourite things: reading, cooking/eating and photography. I guess technically that's four things?? C'est pas important! 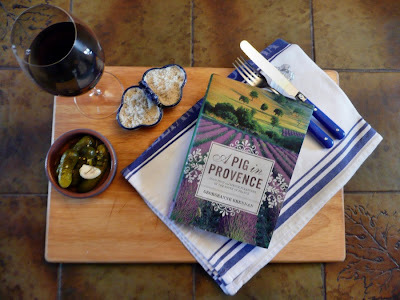 The book I have chosen to share with everyone this week is "A Pig in Provence. 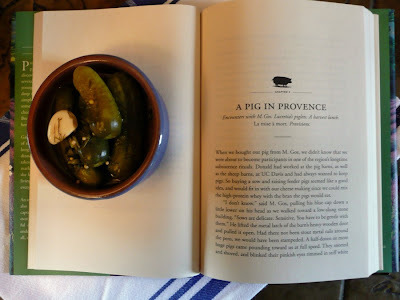 Good Food and Simple Pleasures in the South of France" by Georgeanne Brennan. You can find it here at Amazon. 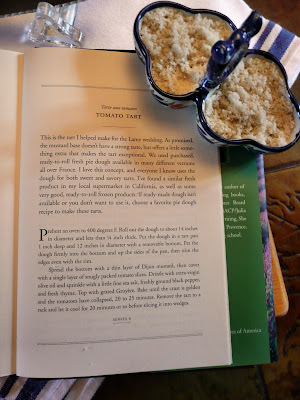 Georgeanne Brennan has written numerous books about cooking and gardening and has received both the James Beard Foundation Award and the IACP/Julia Child Cookbook Award for her writing. She discovered Aix en Provence as a student and returned several years later, to buy a small farmhouse, with her first husband Donald and their young daughter Ethel. 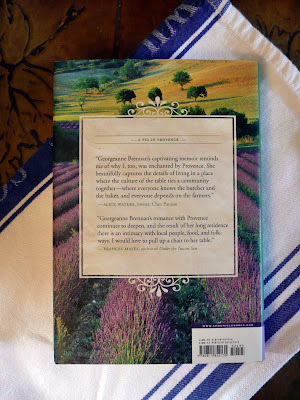 This book spans 30 years and tells the tale of their first home, their lives back in California and Georgeann's return to Provence years later with her second husband, Jim. "Finally, one day I unmolded a batch of cheese that felt different. Each round, dimpled with marks from the mold, felt firm and heavy in my hand as I turned it out for the final time. I put one of the pristine cheeses on a plate and cut a V shaped wedge. The interior was solid and smooth, creamy and white. I tasted it. It was soft, slightly tangy and very, very good. I called Donald and Ethel, who took tastes, and we danced around the room, holding hands". Each of the eight chapters introduces the neighbours who inhabit the area, Mme. Rillier who sold them the goats, M.Gos who supplied the pig. Farming friends Marcel and Marie who hosted wonderful harvest suppers and also"La mise à mort" when the time came to slaughter the pig. Goat Cheese Salad with fried Bread. Braised Pork Shoulder with Mustard and Capers. Juniper Rubbed Chicken Stuffed with Wild Mushrooms. Vegetable soup with Basil-Garlic Sauce. Leg of Lamb with Rosemary, Thyme, and Lavender. Making the tomato tart was simplicity itself and it makes a delicious light lunch served with a mesclun salad. Georgeanne no longer hosts her Cookery School in Provence, due to the weak dollar situation, however, your can read here about the Provence in California- Culinary Weekends held at her Small Farm in Northern California and here you will find her web site. I rate this book: **** Four Stars and I think you'll like it too. 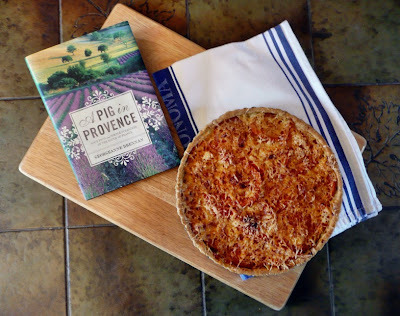 Labels: A Pig in Provence, Books, Food, Food For Thought, Georgeanne Brennan, Tomato tart. Maggie, thank you and thank you again for posting this today. I'll be going out tomorrow to pick that book up - it is just the pick-me-up I'll need to get through a gloomy and grey February. Your photos were a tonic too!! Maggie, I'll be adding this book to my list. Oh, I can tell we are in for a culinary treat when we visit. The tart looks perfect! Those recipes sound great. I am sure that I would have to try the "easier" ones. That book really is "Food for Thought". 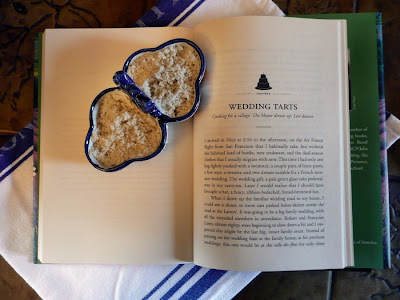 What wonderful descriptions to wet our appetites for both the book & the food! I would love to pick up this book to have on hand for many a menu. 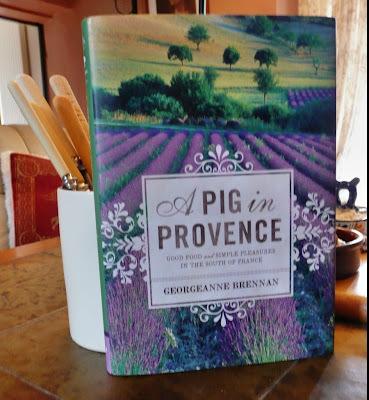 I know I would like this book..I just know it..we wish to go back to Provence..love to cook and this seems charming..your photos are delightful. I'll definitely add this book to my list-food and more food-great! Great review and luscious food! Maggie, I have almost ordered that book several times, now I will for sure. I've quite a number of her books, don't know why I hesitated. It looks like my cup of tea. your food and pics look delish, i hope you had fun, thanks so much for playing at food with thought, my reading list is growing by yards! I love anything to do with Provence so I'm sure I would like this book. I love your photos. 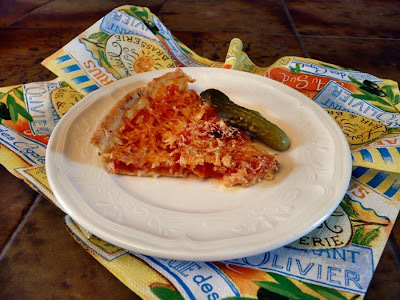 Georgeanne's story looks fascinating and the tomato tart looks divine! I'm sure I'll love this book and the recipes. Both recipe and book lists are getting very long!